If anyone doubts the connection between the economy, the climate and the risk to existing autocratic regimes, they need only look to the protests in Tunisia that began over unemployment, rising food prices and anger at oppression. The unrest in Tunisia has exploded into a national crisis that serves as a warning to autocratic regimes throughout the Middle East. The lack of resources have acted as a magnifying lens on the lack of parity under these regimes. The paradigm, as a result, is changing. People are not so easily distracted toward foreign enemies when their own government turns on a starved population that cannot afford the rising cost of food. That is what has been happening in Tunisia, where as many as 60 people have died in protests that have grown in their size and determination. The Prime Minister, Mohammed Ghannouchi, has taken over the government. The president, Zine El Abidine Ben Ali, who had been in power for 23 years, has left the country. Ben Ali had been trying to placate his young population with initiatives, such as opening up YouTube in 2007, but those were minor concessions in the face of increasing despair. In his speech to the country, the Tunisian prime minister, Mohamed Ghannouchi, said, "As the president of the republic is unable to exercise his functions for the time being, I have assumed, starting now, the powers of the president." The riots began with a tragic act of self-immolation. 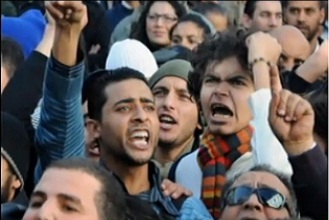 A young university graduate, Mohamed Bouazizi, unable to find a job, had set up a vegetable stand to survive. The police took his vegetables and, in what was the final humiliation for Bouazizi, slapped the educated young man in public. His response was to set himself on fire in front of a government building. There has been similar unrest in Jordan and a long history of similar problems in Egypt. The Tunisia protests, combined with the eruption of riots in neighboring Algeria last week and recent unrest in Jordan, are worrying signs for Cairo. Egypt, the Arab world's most populous country, also has a bulging youth population that has a far harder time landing jobs than other segments of society, and a tightly managed political system that has left little room for dissent. With young populations who have little access to gainful employment, food prices that are expected to continue rising in part to the impact of climate change (Australia's crops have been devastated by floods, Russia's wheat by fire, the U.S. grain supply...), and exposure to information that shows young people the fruits of a better life, the unrest should have been expected. In what seems to be autocratic heads firmly in their own sand, there's been little done outside of Tunisia by the regimes at risk beyond cracking down on their own youth. U.S. Secretary of State Hillary Clinton, speaking at a meeting in Qatar, warned of the consequences of ignoring the situation. Secretary of State Hillary Rodham Clinton on Thursday bluntly challenged Middle Eastern leaders to open their political systems and economies, warning that "the region's foundations are sinking into the sand." Clinton, addressing an international meeting in the Persian Gulf state of Qatar, said the region's states need to share more power with civic and volunteer groups to overcome the problems of exploding populations, stagnant economies and declining natural resources. Unlike Egypt, Tunisia has a growing opposition party that is hopeful their presidents willingness to enact reforms might keep their country from descending into chaos. "This is something we have asked for for a long time and it is very good that he has promised not to put himself forward for the election," said Najib Chebbi, who is the founder of the opposition Democratic Progressive Party (PDP) in a statement to Reuters. "The president has touched on the heart of the issue, demands for reform. That is very important and I salute that ... Frankly I did not expect that, that he would touch on all these problems. "But what remains is how will this be carried out and I ask that a coalition government be created." A journalist working in the region has compared what is happening in Tunisia to the Czech 'Velvet Revolution' where protests led to the fall of the regime. That led to two new democrat nations, the Czech Republic and Slovakia. It is unknown whether Tunisia's riots will result in meaningful democratic reform but it does serve as a warning to regimes at risk in a bad economy Their young populations who see their own choices as limited while their leaders continue to live in autocratic luxury and ignore their cries for help have little left to lose by standing against them.